Islam Around Us: Death toll in Lebanon bombings rises to 47; al-Qaeda blames Hezbollah. 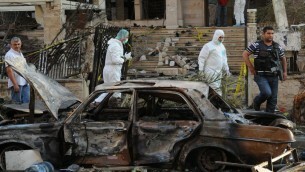 Death toll in Lebanon bombings rises to 47; al-Qaeda blames Hezbollah. 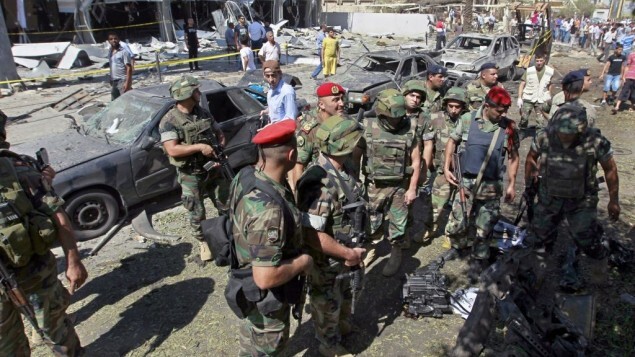 BEIRUT | 24 Aug 2013 :: Lebanese security forces arrested a suspect on Saturday in connection with the devastating double bombing the day before that killed at least 47 people in the northern city of Tripoli, the state news agency said. The National News Agency identified the suspect as Sheik Ahmad al-Ghareeb, and said police took him into custody at his home in the Miniyeh region outside Tripoli. It said al-Ghareeb, who has ties to a Sunni organization that enjoys good relations with Lebanon’s powerful Shiite Hezbollah militant group, appears in surveillance video at the site of one of the explosions. The coordinated explosions Friday outside two mosques in Tripoli, a predominantly Sunni city, raised already simmering sectarian tensions in fragile Lebanon, heightening fears the country could be slipping into a cycle of revenge attacks between its Sunni and Shiite communities. For many Lebanese, the bombings also were seen as the latest evidence that Syria’s bloody civil war — with its dark sectarian overtones — is increasingly drawing in its smaller neighbor. Lebanese police officials said Saturday 47 people were killed and more than 500 wounded in the attack. Some 300 people were still in the hospital a day after the attack, 65 of them in critical condition, the officials said, speaking on condition of anonymity in line with regulations. The United States, United Nations, and Arab League strongly condemned the violence and the loss of innocent lives. Meanwhile, al-Qaeda claimed Saturday that Hezbollah, backed by Iran, was behind the bombings in Tripoli. The organization’s North African branch, al-Qaeda in the Islamic Maghreb, or AQIM, said via social media that it was “certain” that Hezbollah was behind the “heinous act” in Lebanon. The organization also vowed to retaliate for the attack. For its part, Iran said the instability in Lebanon plays into the hands of “the Zionists,” aka Israel.